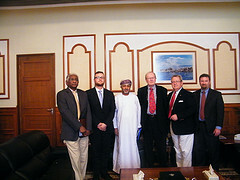 Our final two days in Oman have been filled with meetings with dignitaries and officials. The theme for the last two days have focused on the two governing bodies in Oman – The State Council, which is appointed by the Sultan and the Shura Council which has elected members from the districts of Oman. Oman has a bicameral parliament. At both meetings we discussed the changing political scene in Oman and the excitement about upcoming elections this fall. In a recent royal decree the Sultan reshuffled the appointed State Council to meet recent calls for change from the Omani people. In this new council he appointed council members who had been elected in the Shura Council and granted new legislative powers to the role of the council. This move has generated much excitement among the people as Oman moves towards a more democratic form of government. We also spent time discussing the court and judiciary systems in Oman with meetings at the Ministry of Justice and the Administrative Court system. Both Congressman Buechner and Congress Minge have a background in Law. Congressman Minge sits as a judge in MN. The discussions focused on the rule of law and the interplay between laws made and enforced by the state and Sharia law. We also discussed the role of judges in the Omani court systems – rather than coming from the pool of practicing lawyers in the country most individuals choose a career path to become a judge. The Omani Women’s Association also spent some time with us discussing their role in the nonprofit sector of Oman. OWA works to support women in the region through a variety of programming ranging from training in technology – to educating women on their rights. The basic law of the Sultanate of Oman grants all women equal rights to men and has since it’s creation in 1970. The OWA is one of the oldest and most respected civil society organizations in Oman and is run by volunteers. 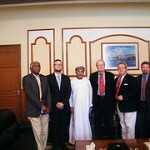 We also had the pleasure of meeting with the US Ambassador to Oman, Richard Schmierer. Ambassador Schmierer discussed with us the important diplomatic role Oman plays in the region. They have a long history of peace and diplomacy. 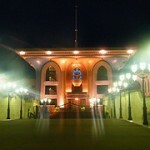 The people and government of Oman are peaceful and strive for progressive change. The Sultan seems to have the best intentions for the people of his nation. 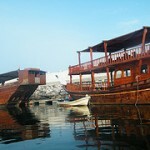 It has been an amazing week in Oman. The people have shown us great hospitality, it has been wonderful to experience all the region has to offer in this exciting time of further development in civil society in Oman.